All my hair fell out over a 2 week period when I was 7. That's right, all of it, head hair, eyelashes, eyebrows and any hair that was on my legs and arms. Shocking right? I don't remember a lot of it, but it must have been pretty terrifying for my family. It started when my mum noticed my hair looked like it had big chunks cut out of it. She had asked if I was cutting my own hair like I had done with my Barbie dolls, which of course I hadn't. From that point on I lost a full set of eyelashes, a brow, then the full matching pair. I remember going to get my "last haircut", my hair was so thin at this stage and they cut it into a short boys haircut to try to tidy it up. Little did we know that it would be totally gone a few days later. My dad was overseas (he is a pilot) and when he left my hair had only just started to fall out, when he got back I was completely bald. 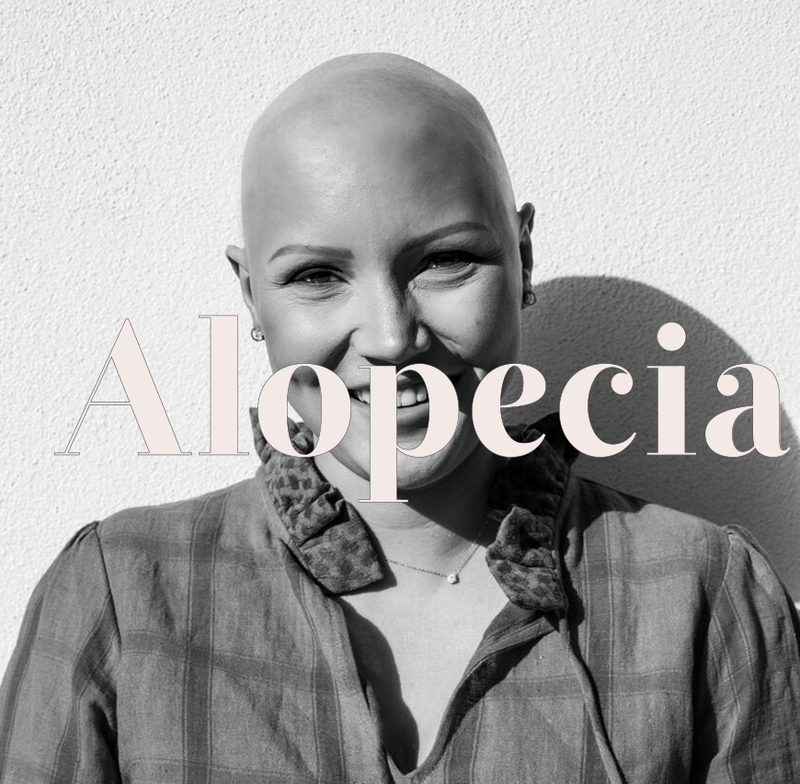 The type of Alopecia I was diagnosed with was Alopecia Universalis, which is the rarest form of Alopecia, around 2% of people suffering from Alopecia have my form. Not a lot is know about what exactly causes alopecia, but what we do know is that it's an Auto Immune disease. Once it is triggered the white blood cells in your body attack your hair follicles so they let go of the hair that they have and stop producing anymore. There is no cure for alopecia and your hair could grow back at anytime. Unfortunately no one knows when, why or how this will happen. Many years of bullying, low self-esteem, and a general glum outlook on my alopecia followed the loss of my hair during childhood. When it first fell out my peers at school were really good about it. The only bad thing I remember being said was that I looked like someones granddad with my big bald patch. At this stage I wore a lot of hats, they became my new "hair". It's when I had to move primary school that things went pear-shaped. I was petrified and made my mum buy me a wig, I refused to let her tell the kids at school and in my mind I was going to hide it from them under my wig. Big mistake! Wigs back then were awful, they were poofy, itchy and didn't look like a little girls hair. First day of school and everyone knew something was different about me. Kids are scared of the unknown and because I didn't talk about my alopecia they were scared of it and that meant they acted out by being mean to me. I was bullied, ostracised and really became very shy and meek. It all came to a head when I was at school camp in my last year of primary. I was wearing Freedom Wigs by this point and they were so much better than everything I had before, they looked much more natural and their vacuum technology meant I could swim in them, hang upside down on the monkey bars and do all the normal things kids want to do, that my pervious wigs wouldn't allow. The only problem was that you grew out of them when your head got bigger. My wig was getting too small, which meant it wasn't staying "stuck" on as well as it usually did. I went down the water slide once and it was fine, but the second time didn't go so well, horribly actually. As I shot off the end of the slide I felt the wig lift from my head and fly through the air. I tried to hold my breath as long as I could under the water as I didn't want to come up. All the kids from school had been crowded around the pool at the bottom, so I knew they had seen my wig fly off and that had confirmed all of their suspicions. I was pretty distraught but somehow my mum persuaded me to stay at camp and talk to everyone about it. Things got a little better from that stage but a new high school brought around the same problems till I settled in with a great bunch of new friends who are all still my best friends today. It wasn't really till I was scouted and started modelling that I gained a massive confidence boost and came to terms with my alopecia. It completely surprised me that once I started modelling people only wanted to use me bald. The photo to the right was the first time I had taken my wig of in front of strangers ever! I was petrified! I had always viewed my baldness as ugly and something to hide but all my experiences in this strange (because it was so new to me) but wonderful industry really helped me redefine my definition of beauty. I realised you didn't have to fit into a conventional box of what beauty "is" to be beautiful, and that beauty wasn't solely something that could be judged by your appearance. I'm talking a lot here about thinking my hair or lack of it, is what made me beautiful or not. This is not something I think about at all now, but as a 13 year old I guess wanting to look nice is often at the forefront of your mind, you just want to be normal, fit in and look good whilst doing it. Now I realise fitting in doesn't matter, its best to be you, everyone is unique and different and that whats make the world an amazing place. Alopecia didn’t define me, but was a part of who I was, and I accepted that hair had nothing to do with beauty. This realization was the turning point in my life and I was lucky that I could turn the situation around for myself. I seriously would be a completely different person today if none of this had happened to me...so I am really glad that it did, as I love me just the way I am.